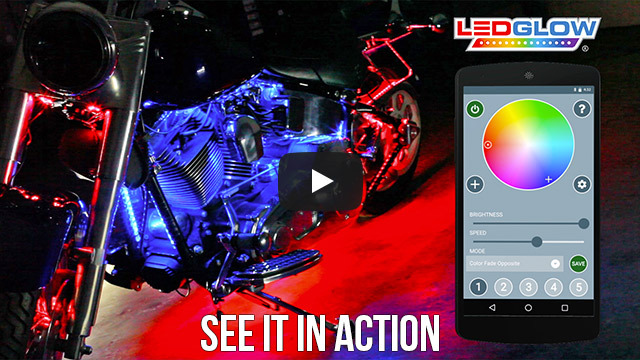 LEDGlow’s Advanced Million Color Control Box with Smartphone Control is the next generation of motorcycle LED lighting by offering total LED control directly from the palm of your hand. This control box is the most powerful on the market, allowing users to install up to 1,000 SMD LEDs for maximum brightness regardless of the size of the motorcycle. Download and install the LEDGlow Motorcycle Control App to customize the look and style of any motorcycle with a few swipes of an iOS or Android device. This control box upgrade is compatible with the Advanced Million Color Motorcycle Kit, Advanced Million Color Mini Motorcycle Kit, LiteTrike Advanced Million Color Kit and Advanced Million Color Pod Lighting Kit. Easily swap out the existing control box on any previously installed Advanced Million Color Kit to immediately take advantage of these amazing new features. It's that simple! Upgrade today! Each control box is filled with a black epoxy potting material which encapsulates all the controls and circuit boards making the control box completely waterproof. This control box will easily hold up to a ride in the rain and any other moisture exposure. This thing is awesome. It makes light control so easy with a simple easy to use app. Love this control box. The dual zone features are awesome especially that "blue wire" (brake light features) the app is very easy to use bill be glad and look forward to the app being updated with added features.. I ordered this for the upgrade to my lights, very easy to install, app works great also. I've not used the remote controls that come with. So I can't say anything about them. But over all I'm very happy with this product and will be ordering one more for my other motorcycle. Installed no issues other then the two 18" light strips I bought with the new Bluetooth unit. It also likes to come on by its self as well.